I got the void elf heritage armor on sylv and checked my greymane char just now. It has the heritage armor too. 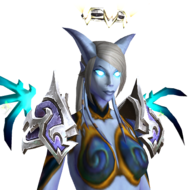 Also I should mention that even my low level void elf chars could mog heritage armor after getting the achieve on a previous 110. Once you hit 110, you should have automatically got a quest in your log, That's how it was for me when I leveled a void elf. Just tried it a few times and also watched other people doing as the video does but there's no turn in/body after it all. I think if multiple people are doing it at the same time, it doesn't work. That's hard to avoid. It seems to be bugged right now and has no turn-in. It worked before the 7.3.5 update so that's why you see others with the achieve done. This happened to me just now but deleting cache and error folders worked for me.